Start and end in Yerevan, Armenia. This 8 day / 7nights Art tour will introduce you to one of the ancient countries in the world. 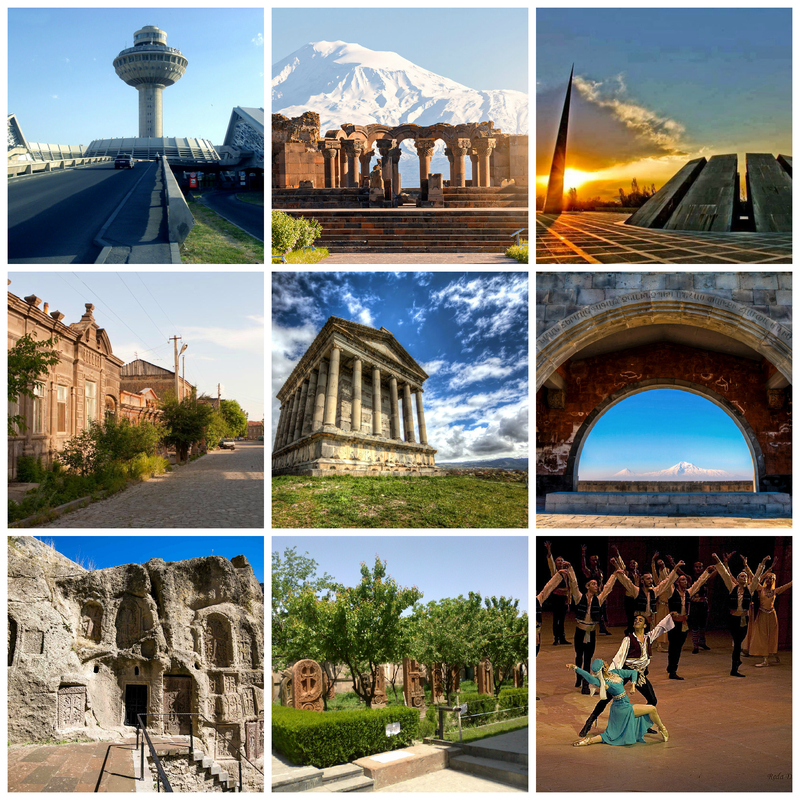 Visit the capital of Armenia – Yerevan and 5 provinces. Visit museums and art galleries, discover the new technique of art – paintings on plexiglass with gold and silver plates invented by an Armenian artist. 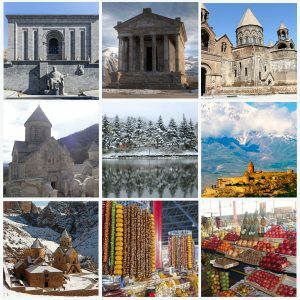 Explore Art and History, Culture and Architecture of Armenia. 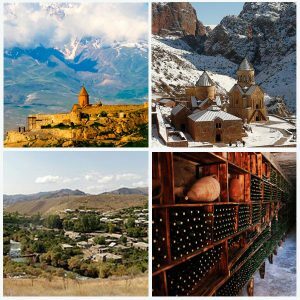 Travel to UNESCO World heritage sites and sample delicious Armenian cuisine. Arrival at Zvartnots International Airport and transfer to the hotel. 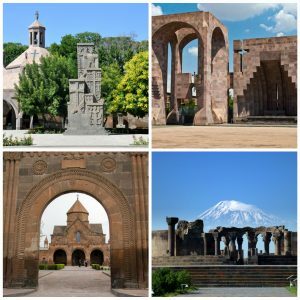 Travel to Khor Virap (meaning “deep dungeon”) monastery and pilgrimage site to learn about Gregory the Iluminator, then return to Echmiadzin to visit UNESCO heritage sites of Echmiadzin Cathedral – the Mother church of the Armenian Apostolic church. Visit the Echmiadzin Cathedral Treasury Museum to see unique pieces of applied art as well as manuscripts with miniature paintings. 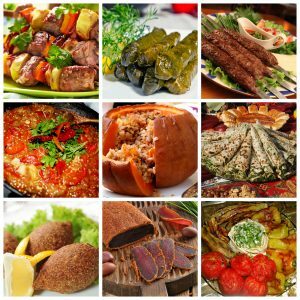 Have a delicious lunch at Machanents Cultural Tourism and Art Center in Echmiadzin, then on to another UNESCO World heritage archeological site-the 7th century Zvartnots Cathedral ruined by a powerful earthquake in the 10th century.Return to Yerevan. 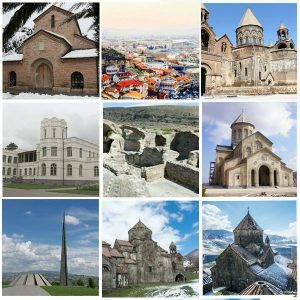 Explore the history of Armenia by visiting the Erebuni Historical & Archaeological Museum-Reserve. Then on to the Armenian Genocide Memorial Complex. Continue to the Military museum in the Victory Park. Afterwards, visit Noy Brandy Factory to sample world-renowned Armenian Brandy. Overnight in Yerevan. 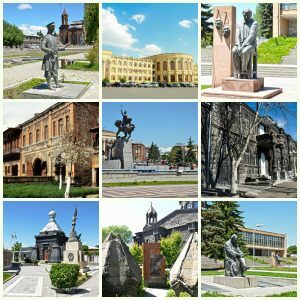 Travel to city of Gyumri in Shirak province. Visit the Museum of National Architecture and Urban Life then on to Cobweb Art Gallery. Continue to Varpetats street then on to 19th century “Yot Verq”(meaning seven wounds) church. Stop by “Erankyuni” restaurant with an interior styled as 19th century Blacksmith forge to taste local cuisine. Return to Yerevan. On the way to village Garni stop at the Arch of Charents named in honor of beloved Armenian poet Eghishe Charents. Discover the most stunning view of mount Ararat from this place. Continue to Garni pagan temple built in the first century A D. Have an Al fresco lunch at a local family restaurant to taste delicious kebabs and salads. Then travel to the 4th century Geghard Monastery complex (the “monastery in the cave”). Return to Yerevan for a guided city tour. Overnight in Yerevan. Start the day by taking part in a 1 hour pottery Masterclass. Learn the history and peculiarities of pottery art and enjoy making your own clay product. 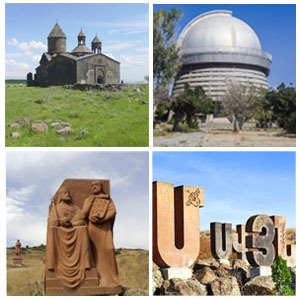 Travel to village Oshakan to the burial place of Mesrop Mashtots – the inventor of the Armenian Alphabet in 405 AD. Then return to Yerevan to visit the factory and Museum of “Megeryan Carpet“. Walk to Arev Art gallery located in the heart of Yerevan to view paintings on plexiglass with gold and silever plates – a unique technique invented by artist Arev Petrosyan. Enjoy the first half of the day at the National Gallery of Armenia, then visit Vernissage – the largest open-air craft market adjacent to the Republic square to find modern and Soviet era crafts, folk art, handmade jewelry and many more. Explore the city center, the State Opera and Ballet theatre, the Yerevan State Pantomime theatre and the nearby parks. Departure. Transfer to Zvartnots International Airport.